We’ve enjoyed the richness of winter root vegetables and stews that kept us cozy during winter's weather. Now, the earth begins to warm and bursts forth with green! As the earth awakens, so do our bodies. We become energized for what is traditionally the hard work of planting season. Some like to do cleanses right after the holidays but I find that a time of rest and recovery and Spring a time to rejuvenate. Many cultures participate in the ritual of spring cleaning. It applies to us as well as to our homes. This tradition is an age old practice. *Chinese medicine associates the spring season with the color green, new growth... and [cleansing] the liver and gallbladder. The Jews ready for Passover by thoroughly cleansing their homes and stomachs of leavened bread. Ready for a cleans? To guide you, look to nature. Greens are what's in season and are extremely cleansing whether eaten raw or lightly cooked. You don't need to spend a fortune; just visit the farmer's market. And after a winter of slow stewing, it’s time for a quick sauté. Foods taste best when eaten in season. Following the seasons gives us foods to look forward to and eating locally grown, high quality, seasonal foods provides more flavor and nutrients at less cost. To help with cost, read on for ideas on using all of the plant. *Bliss, N. 2012. Real Food All Year. New Harbinger Publications, Inc.
Spring garlic, a special Spring treat, is highly nutritious and cleansing. Also known as green garlic, it's availability doesn't last long. This young garlic has hints of purple as apposed to leeks which are green-white. They are delicious sautéed. Replace 1 entire green garlic stem and bulb for 1 clove of regular garlic. 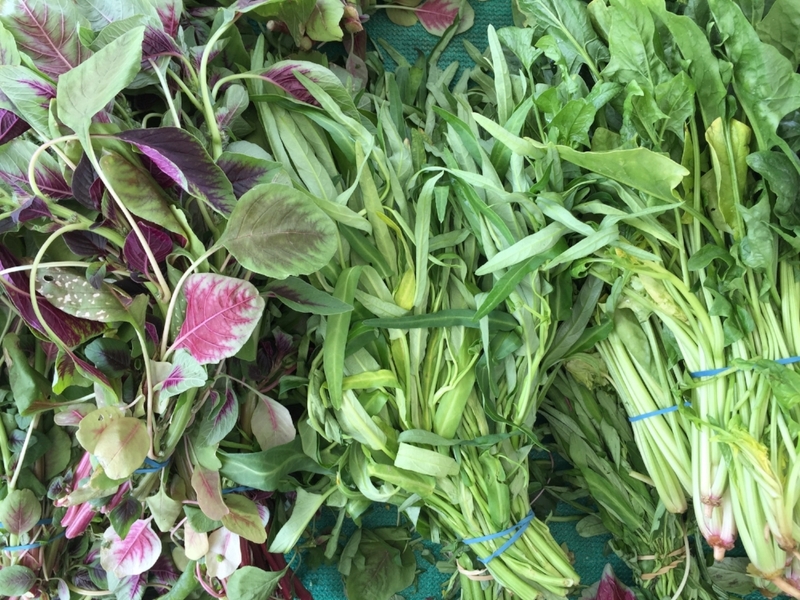 In addition to farmer's markets and produce shares, ethnic markets are a great place to shop for inexpensive greens. The choices are endless! At the farmer's market I found these three types of spinach all used in Asian and Indian soups and stir-frys. Each bunch cost about $1.00. Notice the long stems. When buying bagged spinach, we are paying for someone to clean the spinach and throw away the stems for us. It's expensive and a waste. Spinach stems are delicious in this Sephardic salad with walnut and garlic sauce. Young, Spring carrots are another treat. The carrot family Umbelliferae consist of anise, caraway, celery, parsley, cilantro and coriander, cumin, dill, and fennel to name a few. Vegetables from the same family always taste delicious prepared together. Here are steamed carrots with Carrot-Top Pesto. By adding Spring's offering into your diet, you're off to a great cleansing start! If you're interested in seasonal cooking and eating, I recommend Real Food All Year. It combines ancient Chinese practices with today's knowledge and some simple recipes.